In stock -This product will ship today if ordered within the next 6 hours and 48 minutes. 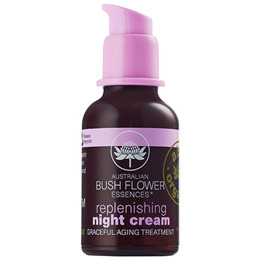 Replenishing Night Cream rehydrates and plumps up the skin which helps maintain a soft and gentle texture. Rich in graceful ageing antioxidants that fight free radicals and promote the elasticity of the skin. It combines natural organic emollients, rich natural antioxidants, beautiful botanicals, exotic oils, rose stem cells and Australian bush flower essences, all within an overnight intensive treatment. Bill Goat Plum, Black-eyed Susan, Crowea, Five Corners, Flannel Flower, Mulla Mulla, Old Man Banksia, She Oak, Wisteria. Organic Aloe barbadensis leaf juice, Organic Simmondsia chinensis (Jojoba) seed oil, Organic glycerin, Coco-caprylate*, cetearyl alcohol*, glycerin*, Organic Butyrospermum parkii (Shea butter), Aqua (Water), Carrageenan (Chondrus crispus)*, glyceryl stearate citrate*, Planchonia careya essence, Tetratheca ericifolia essence, Crowea saligna essence, Styphelia triflora essence, Actinotus helianthi ssence, Ptilotus atripicifolius essence, Banksia serrata essence, Casuarina glauca essence, Wisteria sinensis essence, sodium anisate*, Organic Arnica montana flower extract, Chamomilla recutita (Matricaria) flower extract, Organic Eremophila longifolia (Emu Bush) extract, Organic Santalum acuminatum (Quandong) extract, Organic Solanum aviculare (Kangaroo Apple) extract, Organic Olea europaea (Olive) leaf extract, Calendula officinalis extract, Gardenia florida extract, glyceryl caprylate*, tocopheryl acetate (Vitamin E)*, xanthan gum*, Organic Macadamia integrifolia seed oil, sodium stearoyl glutamate*, citric acid*, sodium levulinate*, potassium sorbate, amyl cinnamal^, benzyl benzoate^, benzyl salicylate^, eugenol^, linalool^. Gently apply to the face after cleansing. Below are reviews of Australian Bush Flowers Replenishing Night Cream - 30ml by bodykind customers. If you have tried this product we'd love to hear what you think so please leave a review.